A mixed bag of a night. CBS: THE BIG BANG THEORY rose 0.2 to 2.3, and YOUNG SHELDON was up 0.1 to 1.8. MOM (1.2), MURPHY BROWN (0.8) and SWAT (0.7) were all steady. ABC: GREY’S ANATOMY held at 1.6, while STATION 19 gained 0.1 to 1.0,and HOW TO GET AWAY WITH MURDER lost 0.1 to 0.7. NBC: SUPERSTORE (0.9) and THE GOOD PLACE (0.8) held last week’s numbers. A special clip-show episode of THE VOICE was low at 0.7. 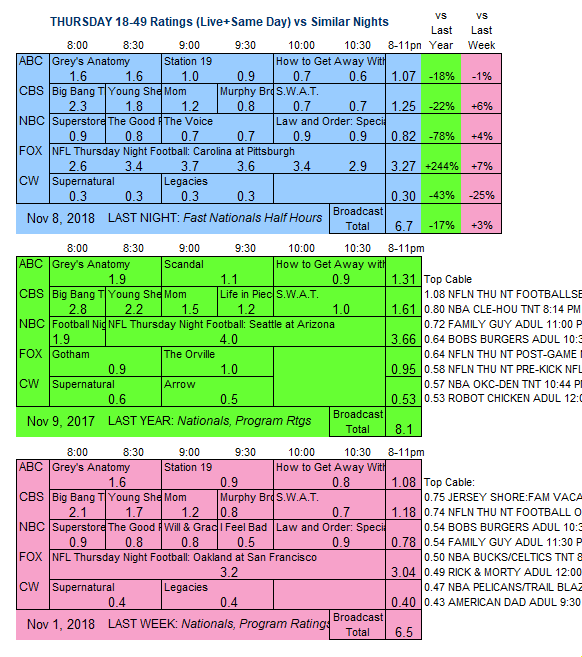 SVU stayed at 0.9. 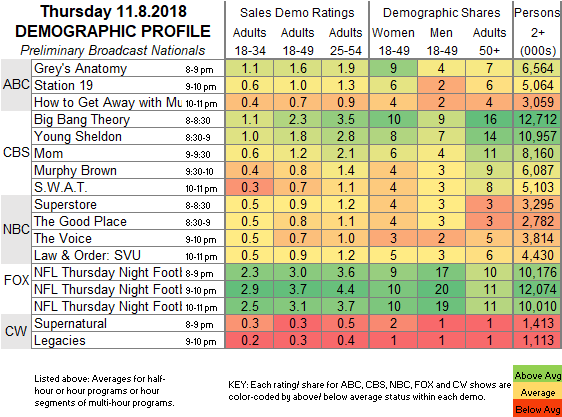 CW: SUPERNATURAL and LEGACIES both dropped 0.1 to 0.3/0.3. FOX: The preliminary 3.3 for THURSDAY NIGHT FOOTBALL was up a healthy 1.2 from last week’s early number. Regular line-ups for all the broadcasters tonight.